Attention teachers and caregivers of young children: your classroom expenses are less expensive at Discount School Supply! To put it another way: you simply get more for your money when you shop Discount School Supply. Budgets are tight and just about everyone is watching their spending. So how do you ensure that the children in your care learn and play with high quality classroom materials without breaking your budget? Shop Discount School Supply, that's how! With our 110% Lowest Price Guarantee, you will find less expensive classroom supplies at Discount School Supply. Shop our enormous selection of quality classroom materials knowing that our prices are extremely budget-friendly. Choose from Arts and Crafts, Furniture, Manipulatives, Active Play, Dramatic Play, Curriculum Resources and more every day at Discount School Supply. 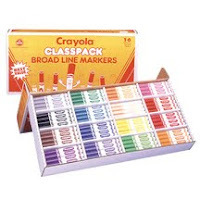 Crayola® Markers Super Classpack® - Set of 256 ONLY $58.99! Frontier Building Set - 160 Pcs. ONLY $24.95! Click here now to find more top quality budget-friendly deals at Discount School Supply. Shop Discount School Supply today and get more for your money. With less expensive classroom expenses at Discount School Supply, you can stretch your budget further and still enable the young ones in your care to play, learn and thrive. Discount School Supply has gone and done it again: we've found a way to offer even MORE dramatic savings, baby! Savings on dramatic play and baby items, that is! Sure, the everyday savings on classroom essentials at Discount School Supply are terrific, but for a limited time, there are bigger and better savings for two of our product categories: Infant/Toddler and Dramatic Play. Click over to Discount School Supply right now and take an extra 20% OFF all Infant and Toddler products as well as an additional 20% OFF all Dramatic Play items. 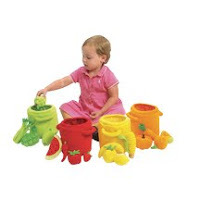 Fruit & Vegetable Sorting Set - 20 pieces ONLY $30.36! Life-Sized Fruit & Veggies - 38 Pieces ONLY $31.99! 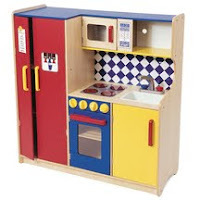 Pretend & PlayTM Cash Register ONLY $27.99! 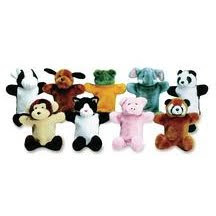 Big Mouth Animal Puppets - Set of 8 ONLY $17.59! Early childhood teachers, now is the time to get a great deal on educational materials. Caregivers, if you've got infants and toddlers in your care, today is the day to shop and save. Parents, find top quality and top-rated products for your early learner within your budget. But you have to act now! 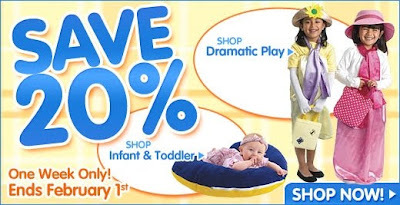 This special offer on Infant/Toddler and Dramatic Play items ends February 1st. So click to start saving with this special sale right now. And don't forget: Discount School Supply has everything you need to help your little ones learn. Shop Arts and Crafts, Furniture, Manipulatives, Curriculum Resources, Active Play and more every day at Discount School Supply. Save more at Discount School Supply. Discount School Supply is proud to introduce the MyRider™ family of tricycles by Angeles® featuring the innovative Vario Seat™. Angeles®, the most trusted name in trikes, has launched the biggest innovation in trikes this century with the Vario Seat™. Exclusively available on the MyRider™ line of trikes, the Vario Seat™ is a revolutionary and versatile riding solution that gives each child a bett er fit. The seat is specifically designed to accommodate children of varying sizes and it can only be found on the MyRider™ family of tricycles. MyRider™ tricycles are also durable and resilient. The steel frame is powder-coated to resist rust and scratches. The handgrips are made from heavy-duty rubber and the wheels are spokeless with solid rubber tires. This sturdy, no-pinch design is sure to be a hit during active play time for your little learners. 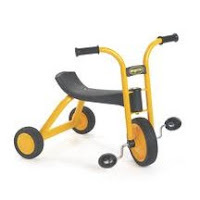 These trikes will stand the test of time as child after child can call it their own. Moms, dads, teachers and caregivers: click over to Discount School Supply right now to find out more about MyRider™ family of tricycles from Angeles®. You are sure to be impressed with all of the MyRider™ tricycles and the innovative Vario Seat™. And while your on the Discount School Supply website, don't forget to check out all of our other top quality products for early learners. Shop for great deals on Arts and Crafts, Manipulatives, Furniture, Curriculum Resources, Dramatic or Active Play items and more exclusively at Discount School Supply. At Discount School Supply we know that despite the new year, budgets are still tight. Stretching your dollar is the new reality. Thankfully, helping you stretch your dollars has always been the goal here at Discount School Supply! Teachers, parents and caregivers of young children, we understand you need to spend your money wisely. We know you want top quality early childhood learning supplies that fit your budget, and we're committed to helping you provide the best for your little learners without breaking the bank. 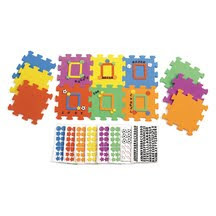 Start with Classroom Puzzle Frame Kit - Set of 12 for ONLY $9.99. Pick up some Cat & Dog Foam Shapes- 500 Pieces for ONLY $2.97 to decorate the puzzle frames. Of course, you would need some glue, so get the Colorations® Repositionable Glue Sticks - Set of 12 for ONLY $5.47. Not including tax and shipping, you're out the door for under $20! 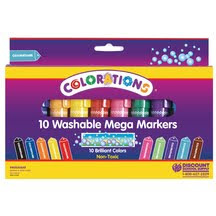 On your way to check out, grab a set of Colorations® Super Washable Mega Markers - Set of 10 for ONLY $4.49 and you've got some great Arts and Crafts supplies to last you a long time! And that is just one solution! Create your own $20 solution at Discount School Supply right now. You'll find Arts and Crafts, Furniture, Manipulatives, Active/Dramatic Play, Curriculum Resources and more great products for your early learners with the 110% lowest prices guaranteed. Get more for your money every day at Discount School Supply. See for yourself. Click here right now and stretch those dollars! 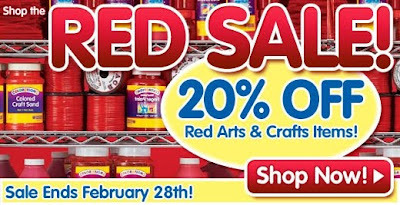 The Annual Red Sale is back at Discount School Supply! For a limited time, save an EXTRA 20% on everything RED in Arts and Crafts. Parents, crafters and teachers: take a quick peek at your arts and crafts materials. Was your stock depleted after the holidays? 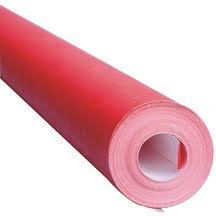 Are you running low on red paint and red construction paper? Do you want to save big on red in time for Valentine's Day crafts? 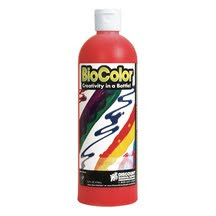 Red BioColor® Paint, 16 oz. ONLY $2.39! Find great new arrivals in Arts and Crafts, Dramatic Play, Furniture, Special Needs, Manipulatives and more right now at Discount School Supply. 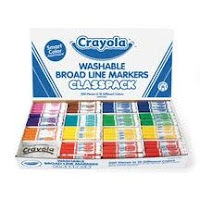 Stock up up your Arts and Crafts center with the Crayola® Color Smart Washable Marker Classpack® - Set of 200 for ONLY $69.99. Discount School Supply and Crayola® partner to bring you this exclusive washable Classpack® with more of the colors you need most! 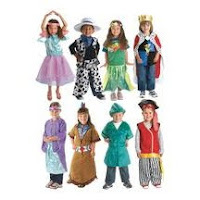 For Dramatic Play, bring imagination to life with Discount School Supply's exclusive Make Believe Costumes - Set of 8 for ONLY $139.99. This set includes buccaneer, woodsman, king, cowboy, princess, ballerina, mermaid and Native American girl - a make-believe world of possibilities! Infants and Toddlers love the tactile sensory discovery with the Tactile Petal Playmat for ONLY $29.99. This machine washable mat is a gentle place for little ones to explore and build motor skills. Engage your future scientists with the Acrylic Butterfly Specimens - Set of 4 for ONLY $29.99. 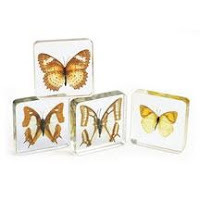 This set provides a close-up view of real butterfly specimens encased in durable, clear acrylic. Observe extraordinary details on wings, antennae and bodies. And there's so much more! Click here right now to see the latest and greatest early learning products from Discount School Supply. Parents, teachers and caregivers: kick off your new year with some great deals on new products exclusively from Discount School Supply. Click here to shop now!